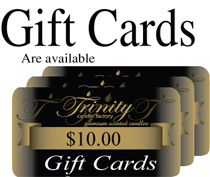 Trinity Candle Factory Premium Scented Jasmine Candle - Pillar Candle - 4x6. This 4x6 Pillar Candle is premium scented for maximum fragrance throw. With a 100-110 hour burn time, cotton wick and premium scent, this candle is an absolute must. This Jasmine fragrance is an old fashioned favorite. The scent of the morning jasmine flowers lingering in the morning breeze. A very nice floral aroma. 100% Satisfaction Guarantee.